Have you ever wondered what a small tin of natural cream can do to your skin? 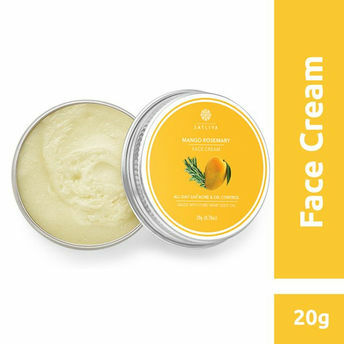 Satliva Mango Rosemary Face Cream is an amazing moisturiser which deeply hydrates, nourishes skin cells and clears toxins stored in the skin cells for a long time. It is a unique blend of Indian hemp seed oil, mango butter and rosemary essential oil. The combination is loaded with amino acids, minerals and vitamins, that are required for healthy and naturally glowing skin. Rosemary essential oil with its anti-inflammatory and astringent properties keep acne at bay. This amazing face cream, thanks to the rich antioxidants in Indian hemp seed oil and mango butter, helps in cleansing by clearing clogged pores and dead skin cells, while protecting the skin from harsh pollutants and sun damage. It is a nutrient rich cream that deep cleanses skin cells and effectively removes and diminishes acne, marks, scars and pigmentation. This soothing cream is a blessing to the skin. The multi-blend hemp face cream is all that you need for your clear skin goals. This face cream, with abundance of vitamin A, C and E, and Omega-3 will helps the facial skin to recover faster, leaving behind a clear, soft and glowing skin. Alternatively, you can also find many more products from the Satliva Mango Rosemary Face Cream range.